Place your Cannabis butter into a bowl. Grab another small bowl and combine the flour, baking soda, and salt. In the bowl that has your cannabis butter, add the white sugar, and vanilla and mix it. Now add one egg, beat until it is fully mixed, add the other egg and repeat. Continue to mix as you slowly add the flour mixture from the small bowl. When fully mixed stir in the chocolate chips and nut mixture. If your dough mix is too dry and hard then add a small amount of water and mix until slightly sticky. Separate your dough mixture into five or six smaller balls of dough, and place them on a very lightly greased baking sheet. Preheat your oven to 375 degrees. Place the baking tray into the oven and let it bake for around 10-12 minutes, or until they look cooked! They should be a golden brown color. Let you cookies fully cool, preferably on a wire rack. They are now ready to eat! The cannabis bud that you simmered in the saucepan can be left out to dry over a day or two and smoked, it won’t be a very strong anymore, but hell you don’t want to waste the bud even if it doesn’t get you too high. Dosage: The cannabis butter will be a lot stronger than you might think, but as with all digested cannabis it can be a while before you feel the effects. Eat one of the cookies immediately, one half an hour later. 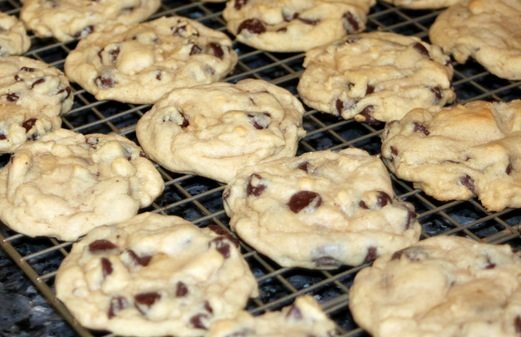 Do not consume another cookie for at least an hour, to ensure that you are not too high. Before you consume these cookies please ensure that you have other things to eat if you get the munchies, otherwise you might be too tempted to eat your remaining Magic Cookies and this isn’t going to stop your munchies!